Hebrew Charters: Does Crafty Compartmentalization of Secular and Religious Programs Equal A True Separation Of Church And State? Over the past two years I've written multiple posts about the Hatikvah International Academy Charter School in East Brunswick. Most recently I've written about their proposed expansion, and some of the issues involved, including the fact that Hatikvah has morphed into a statewide charter, drawing from 21 districts across the state, and that they seem to be attracting a less diverse and more privileged student body, leading the charter to "recruit for diversity" in a district that's 98% minority and 93% free/reduced lunch. As one of his parting acts, on Friday February 28th, which is his last day on the job, Commissioner Chris Cerf is expected to announce his decision on the proposed expansion. Will the Commissioner heed the advice of the six Superintendents most impacted by Hatikvah, and deny the expansion? There is one issue not addressed in the letter, that even I have not broached yet. I fully expect this to be explosive, and to generate some serious criticism. I'm ready for it, so let's dive in. HCSC founder and funder, hedge fund demi-billionaire Michael Steinhardt, was pretty clear about his intentions back in 2008. Hard not to notice that when Steinhardt conceived the idea he referenced a nationwide system of "Jewish" charter schools, not "Hebrew" charter schools. And what communal needs can a Jewish Hebrew charter address that private Jewish day schools can not? Why, they can be funded with public tax dollars of course! The nation’s first Hebrew-language charter school, the Ben Gamla Hebrew Charter School, sparked a firestorm of debate when it opened last August in Hollywood, Fla. Critics, including some in the Jewish community, warned that the school could blur the dividing line between church and state. Others in the Jewish community, including Steinhardt, praised Hebrew charter schools as a way to strengthen Jewish identity without the private and communal expense of day schools. Did you catch that? A way to strengthen Jewish identity without the "private and communal expense" of day schools. But it takes a serious influx of cash from the HCSC before each school can reach "self sufficiency" ie., a reliance only on public tax dollars, not private philanthropy. So, Steinhardt's goal for HCSC charters like Hatikvah is to "strengthen Jewish identity" without the pesky costs to parents or philanthropists, and to ultimately be able to subsist on government funds alone. But the one big stumbling block is that Jewish day schools offer both secular and religious educations. So how can Steinhardt get the best of both worlds? When Hatikvah was first approved and preparing to open they were very clear that they planned not only to create a religious afterschool program for their students, but to model their program on the Jewish Upbringing Matters Program (JUMP) created by the Ben Gamla Network. Rabbi Shlomo Landau of Torah Links is looking to starting the after-school JUMP (Jewish Upbringing Matters Program), modeled after a Hollywood, Fla., program that began in 2008 to serve students of the Hebrew-language Ben Gamla Charter School there. The daily after-school Jewish studies curriculum would be open to students of varying backgrounds. It seems that while Rabbi Landau was getting the JUMP-esque program off the ground, Hatikvah started with a program called Chai Central, which was run by the Chabad of East Brunswick, and heavily funded by the HCSC. Members of Chabad, the chasidic sect known for its outreach to liberal and unaffiliated Jews, run Chai Central, the optional after-school Jewish studies program for Hatikvah students. So how much did Chabad get to develop and run Chai Central? Let's look at the HCSC 2010 990 to find out. WOW! $132,000!! And note that the JUMP program in Florida also got $100,000 and Hatikvah itself got almost $250,000. Chai Central was eventually replaced by the Nefesh Yehudi Academy (NYA) which is run by Rabbi Schlomo Landau, who as previously mentioned, was originally tapped to model Hatikvah's after school program on the Ben Gamla JUMP program. At the Hatikvah International Academy Charter School in East Brunswick, N.J., a program called Nefesh Yehudi offers students a religious education at a nearby Reform synagogue. So let's find out a little more about Nefesh Yehudi. The mission of Nefesh Yehudi Academy is to provide a Jewish education to complement the curriculum of a Hebrew immersion charter school program, while encouraging students to appreciate the diversity of all Jews. The curriculum, which is guided by Traditional Jewish and Zionist values, includes the study of written and oral Torah, Jewish history and laws, Mitzvot, and prayers. The program prepares our graduates to succeed in a Jewish high school if they so choose. Not sure what's up with all the cloak and dagger secrecy, but the name of the charter is not mentioned anywhere on the website, just veiled references to "a Hebrew immersion charter school program." You'll only find specific mention of Hatikvah if you open up the registration form. In general, the NYA program follows the schedule of Hatikvah International Academy Charter School (“Hatikvah”). That is NYA programming is held Mondays through Thursdays on days where Hatikvah is in session. The NYA program begins approximately 15 minutes after dismissal from Hatikvah and ends at about 4:40pm on those days. And you don't want to miss this curious Q & A in the FAQ section. 9. My child attends public school. Can he/she attend NYA? Seems the good folks at NYA need a reminder that a charter school is a public school. But the more troubling implication here is that the religious afterschool program seems to have knowledge of the curriculum offered at the charter, and how to expand upon it, which also seems to mean that the Jewish students that attend the afterschool program may receive curricular advantages and supplements that are not afforded to both the Jewish and non-Jewish students that do not attend NYA. I also find it curious that NYA held Open Houses that were advertised to the general public in numerous local publications, including the East Brunswick Patch and the East Brunswick Sentinel. 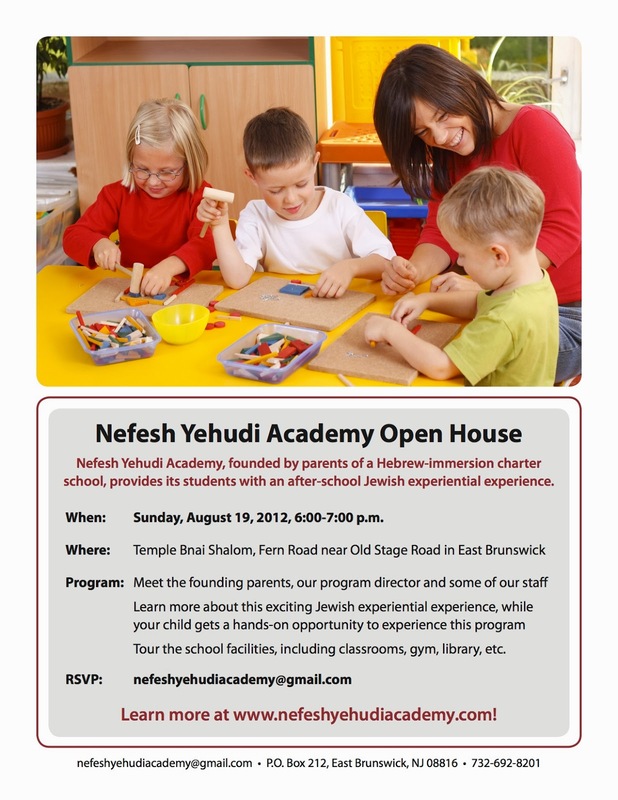 Nefesh Yehudi Academy, which was founded by parents of a Hebrew-immersion charter school and provides students with an after-school Jewish experiential-learning experience, will hold an open house 6-7 p.m. Aug. 19 at Temple B’nai Shalom, Fern Road near Old Stage Road, East Brunswick. Guests will meet the founding parents, the program director and some staff members. Children will have a hands-on opportunity to experience the program. There will be tours of the school facilities including classrooms, gym, library, etc. What's so interesting about this is that, as we have already established, NYA is only for students that attend Hatikvah, so why advertise to the general public? (And again, what's with not identifying Hatikvah by name? What are they trying to hide?) Why not spread the word only to existing Hatikvah families, since they are the only ones that can attend? Sure seems like a way to interest parents in a low cost religious education ($2,625 according the website) and then get them to apply for admission to Hatikvah. Interesting way to recruit for a charter school, no? This practice alone raises serious questions regarding the true intent behind Hatikvah, and also raises doubts as to how "hypervigilant" they really are about the separation of church and state. So, we've already established that HCSC bankrolls both the secular Hebrew charter school and the religious after school program. So is it just me, or does a Hebrew charter just seem like a clever way to divide up and try to disguise the true intent, which is to provide an inexpensive Jewish day school education, by subsidizing the secular part of the day school educational experience on the public dime? What is equally, and perhaps even more concerning is that the HCSC doesn't just give money to Hatikvah and the religious after school program and then step back and allow them to govern the schools independently without interference. There is a surprising amount of direct influence. And the HCSC has similar influence over Nefesh Yehudi. Hatikvah is affiliated with the New York-based Hebrew Charter School Center (HCSC), which provides financial support and curriculum development assistance to Nefesh Yehudi. “It’s a whole new model for Jewish education,” said Rabbi Shlomo Landau, the program’s director. But what may be more surprising, and even more telling, is that they Steinhardt Foundation for Jewish Life, Steinhardt's original philanthropic behemoth, has very direct control and influence over Hatikvah. Here's a little bit about the Steinhardt Foundation. In fact, The Steinhardt Foundation seems to have some remarkably direct, remarkably significant influence over Hatikvah's governance, in the form of an individual by the name of Eli Schaap, the Steinhardt Foundation's Director of Education and Research. Schaap just so happens to be a voting member of Hatikvah's Board of Directors, where he serves as the chair of the Finance Committee, and he is also the President of the Friends of Hatikvah International Academy Charter School, Inc., the nonprofit created to raise money for and distribute money to Hatikvah. In 2011, HCSC stopped giving money to Hatikvah directly, and started funneling it through the Friends of Hatikvah, so it seems Schaap controls the money at virtually all points. And in case you think I am jumping to conclusions, Schaap's resume, submitted as part of Hatikvah's 2011-12 Annual Report, makes it clear that the roles he plays in the various HCSC network charters, including Hatikvah, and within the HCSC itself, is actually part of his job responsibilities for the Steinhardt Foundation for Jewish Life. And Schaap is paid handsomely for his work for Steinhardt. According to the 2011 990, he made $196,198. Not sure how much clearer it could be that the Steinhardt Foundation for Jewish Life, whose goal is to "revitalize Jewish identity through educational and cultural initiatives that reach out to all Jews", has tremendous influence over the HCSC and the supposedly "secular" Hebrew charter schools they fund and support, such as Hatikvah. Diane Ravitch recently wrote an incredibly pointed blog post about Hebrew Charters. No matter how the folks at Hatikvah, the Hebrew Charter School Center, or the Steinhardt Foundation for Jewish Life try to spin the "non sectarian identity" of Hebrew charters, a closer look at the money trail and the direct involvement of Steinhardt's philanthropic organizations in all aspects of Hatikvah's financial affairs, and both the secular and religious components of Hatikvah's educational programs, seems to defy such protestations. Seems like something Commissioner Cerf should consider when deciding whether to allow Hatikvah to expand, and something his successor should consider when he/she conducts Hatikvah's next annual review. Should A Quasi-Private-Elite Hebrew Charter Be Allowed To "Recruit Diversity" In An Apartheid District? February is here, and that means by the end of the month Commissioner Christopher Cerf will decide whether to allow the Hatikvah International Academy Charter School to add a Middle School to their current K-5 charter, and add an additional class of 25 students per grade. The expansion would allow Hatikvah to double their enrollment. I have already detailed many of my concerns with Hatikvah's proposed expansion, including the fact that, since opening in 2010, Hatikvah has morphed into a statewide charter school. That Hatikvah has enrolled students from 20 other districts in 6 counties. This clearly demonstrates that while Hatikvah is only approved to pull students from East Brunswick, in the four years since their approval they have morphed into a statewide charter school. Only 57% of their students come from East Brunswick, the only district they are approved to serve. The statewide nature of this charter is not my only concern. I am also troubled by the demographic makeup of the charter. Bruce Baker recently wrote an amazing post about the demographics of Princeton Charter School, which he found to be more like Princeton's local private schools than public schools. Urban charter schools have arguably taken their toll on urban catholic school enrollments, but that’s another story. But, to the extent that state charter policies permit the type of school establishment and segregation going on in Princeton, more and more parents may find ways to organize quasi-private-elite schools to serve their needs – effectively seeking taxpayer charity to support their country club preferences. This indeed may pose a threat to financially less well endowed private schools. In a twisted sort of way, it’s rather like asking your local public parks department to pay for your membership to the local private country club – thus reducing the quality of services to others who really don’t have access to the country club (even if it proclaims it’s open to all comers). Well Bruce, I think the numbers at Hatikvah raise some serious red flags, too. 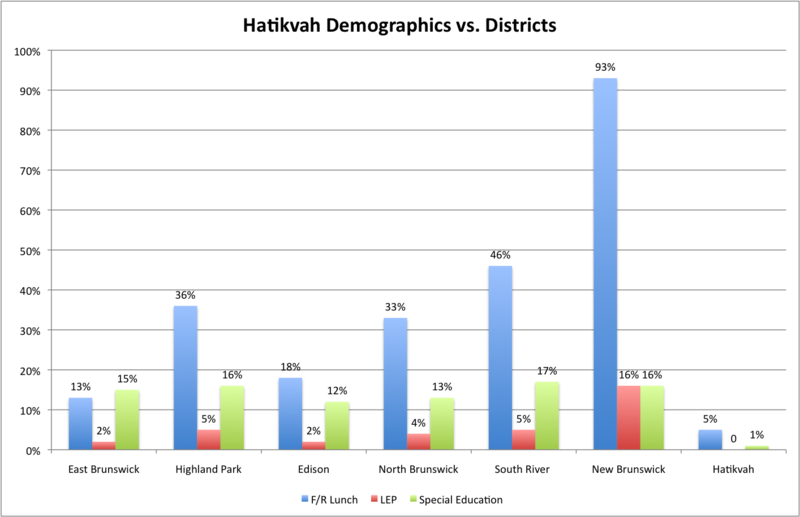 I took a page out of his playbook and looked at the state data to compare Hatikvah to their top five sending districts. I added New Brunswick too, for reasons that will become apparent a bit later. Hatikvah and HLA are the first charter schools to open with assistance from the year-old Hebrew Language Charter School Center, funded by a group of prominent Jewish philanthropists who include Michael Steinhardt and Harold Grinspoon. The center, which last week hired Aaron Listhaus, the chief academic officer of the New York City Department of Education’s Office of Charter Schools, as its executive director, makes no mention of Jewish day schools, or targeted Jewish populations, on its website or in any of its published materials. At Brooklyn’s HLA, in an urban district that encompasses poor, middle-class and wealthy neighborhoods, 37 percent of the students are African-American, many of Caribbean descent, and 68 percent qualify for free or reduced school lunches. Of the children assumed to be Jewish, many are the children of Russians and Israelis. 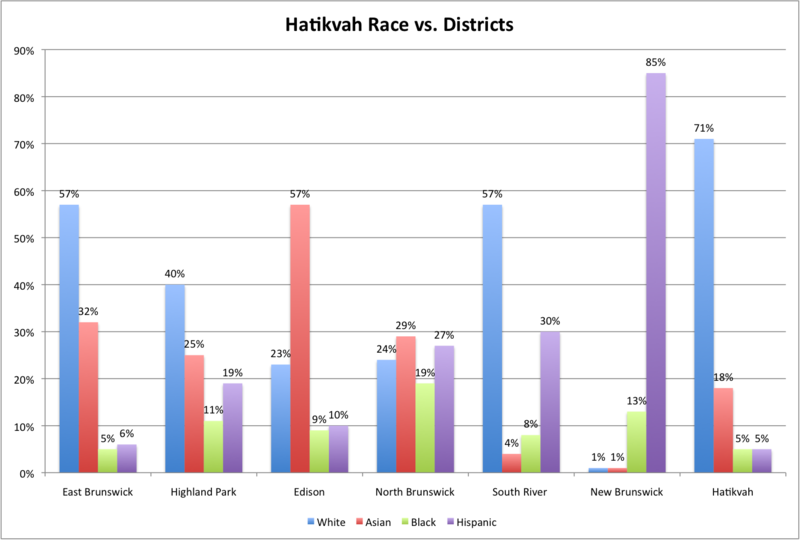 If Hatikvah was 40% non-white when they opened, and are only 29% non-white in 2013, looks like they are becoming more white and less diverse over time, not more. Let's look at some of the other demographic characteristics of their students, maybe there's some diversity there. Hatikvah also has less Free/Reduced Lunch, Limited English Proficient, and Special Needs students. In fact, they have a lot less. It brings us back to Bruce's argument, that charters that serve a more affluent, less diverse population are asking the rest of us to fund a "quasi-private-elite school" that suits the needs of a select few. Hatikvah was recently cited as one of the causal factors in the closure of the East Brunswick Solomon Schechter Jewish Day School. 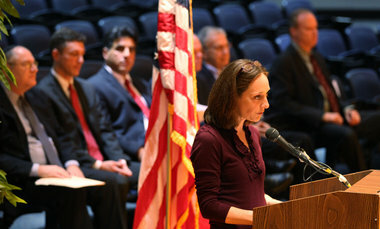 Kamens blamed the school’s closing on a “perfect storm” of factors, including demographics, a poor economy causing more students to ask for tuition assistance as fund-raising efforts faltered, and competition from other day schools and the Hatikvah International Academy Hebrew-language charter school in East Brunswick. And not only did Hatikvah contribute to the demise of Solomon Schechter, once it was closed even more Schechter students ended up at Hatikvah. With only three weeks left until the start of the school year, the majority of parents had already taken their children out of the school and enrolled them elsewhere, mainly East Brunswick Public Schools, Solomon Schechter schools in West Orange and Marlboro and Hatikvah International Academy Charter School, Rabinowitz said. Seems pretty clear that a lot of what Bruce noted in Princeton is also happening in East Brunswick. Hatikvah appears to be another excellent example of what he describes as "taxpayer charity" that supports a "country club preference." The additional concern with Hatikvah is that the charter clearly caters not just to a "country club" preference, but to a religious preference as well. More to come on this very soon, stay tuned. Something else I find troubling about the lack of diversity at Hatikvah is that this "quasi-private-elite school" that bears little resemblance to the districts it serves, uses their standardized test scores to compare themselves to the sending districts. The purpose here seems to be two-fold; to claim superiority over the district schools, and to make the case for their expansion. This is pulled directly from the Hatikvah Renewal Application, which includes the expansion request. They just forget to mention that they aren't serving the same population of students. There does seem to be a dim awareness that Hatikvah isn't meeting the stated mission of the HCSC to "serve a diverse population." In fact, in Hatikvah's 2012-13 annual report they make a very peculiar statement. One that sure got my attention. Hatikvah plans to "recruit" for "student diversity" and "free/reduced lunch" students in New Brunswick, a district they aren't even approved to serve? (Now you know why I included New Brunswick in the statistics) How exactly does this demonstrate their "recruitment practices are free of discrimination?" Sounds kind of discriminatory to me to target a specific district in search of poor, minority students. But it's certainly easier for Hatikvah to find the poor minority students they seem to be looking for in New Brunswick. Afterall, look at the demographics; 93% Free/Reduced Lunch and 98% Black and Hispanic. New Brunswick Public Schools are just on the cusp of being what Rutgers researcher Paul Tractenberg recently defined as "apartheid schools." A new Rutgers University report on so-called apartheid schools in New Jersey says that 26 percent of black students and 13 percent of Latino students attend schools where 1 percent or fewer of the students are white. The study argues that although New Jersey is a wealthy, mostly suburban state with a tradition of strong public schools, its black students face more extreme segregation than blacks in the South, where segregation was long mandated by law. It said another 21 percent of black students and 29 percent of Latino students in New Jersey attend “intensely” segregated schools where 10 percent of the students, or fewer, are white. It is reasonable to ask whether Hatikvah should be allowed to recruit students in New Brunswick to make their charter appear more diverse, when they seem to be attracting a predominantly white, (Jewish? ), affluent student population. Especially when you consider this statement in their 2011-12 annual report. No lunch program for the Free/Reduced lunch kids, who are entitled to (and the charter receives federal funding for I assume) 10 meals a week? They only get a "complimentary nutritious entrée" (am I the only one that finds the accent over the é completely insulting and more than a little ironic here?) three times a week from the PTO! Perhaps now that Hativah is in their shiny new warehouse facility it's possible they have started a lunch program. It's certainly a question I'd be asking if I were the Commissioner of Education and I was considering their expansion. And if they have not started a lunch program, and they are indeed recruiting free/reduced lunch students anyway, well, then I'd have a thing or two to say about that. What do you think? Should a statewide charter that seems to attract a predominantly white, affluent student body be allowed to "recruit diversity" in an apartheid school district? Let me know what you think in the comment section below. If you think this is pretty shady, please consider adding your name to the over 1,100 signatures on the petition asking Commissioner Cerf to deny Hatikvah's expansion. Predatory education reform has reached a crescendo in New Jersey's largest cities. Newark public schools are being closed, sold and privatized. “In late December, 2013, just days before the start of winter vacation, the Christie administration informed Newark families that it was closing many of our public schools and turning others over to private management. “The school closings and privatization would: Eliminate local public school options for thousands of children, forcing some to take two to three buses to get to school; Destroy school communities that go back more than 80 years; Remove historic public buildings from community use. 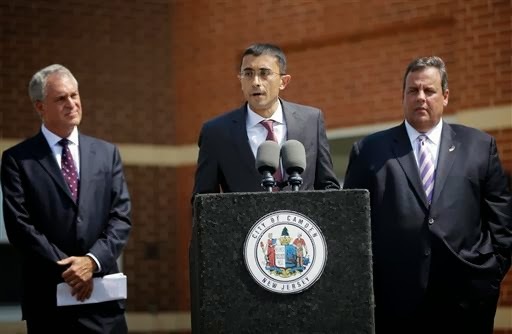 “Yet we, the people of Newark, whose children attend those public schools, were not consulted in any way before the Christie administration made this decision. Camden is not far behind. And that is what is sad about this current plan. It had the potential to focus on things that the community could rally around; universal pre-K, school repairs, school dinners, safe corridors. Instead, those (positive) steps are being used to sweeten a bitter pill; the announcement of school takeovers that comes next week and will turn Camden into Newark into New Orleans. Parents are being given a devil of a choice: a status quo in which they are punished by state legislation, or money that is linked to the erasing of their history and community. Those who manufactured a crisis should not get credit for fixing it. Parent groups are rising out of the chaos to fight back and make themselves heard. Parents Against One Newark Program has successfully gotten the attention of the media, and rallied behind legislation intended to allow districts, even those under state control, to have a say if a school is slated for closure. 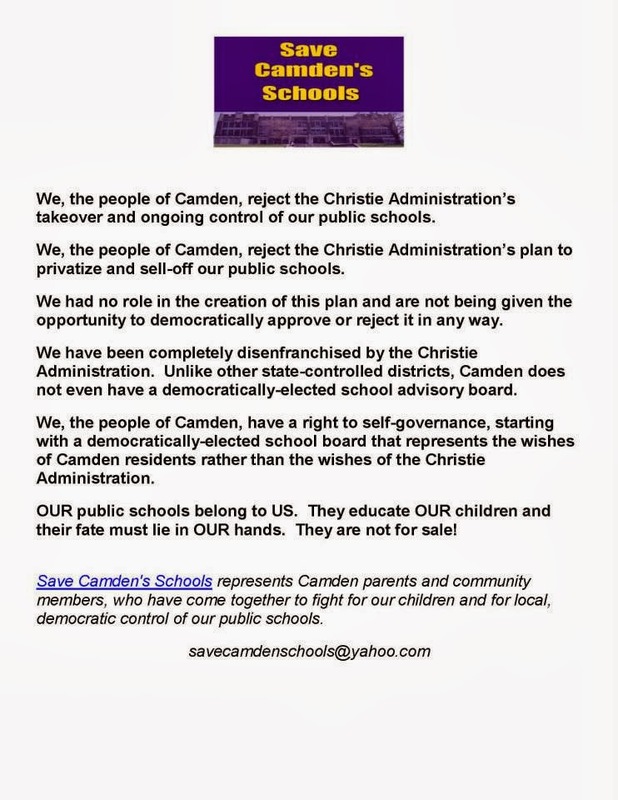 Save Camden's Schools has launched as well, and in less than a week has garnered 700 likes on Facebook, where they released a powerful statement in defense of their public schools. I am proud to know many of the fearless activists fighting in these cities, and I stand with them in solidarity. 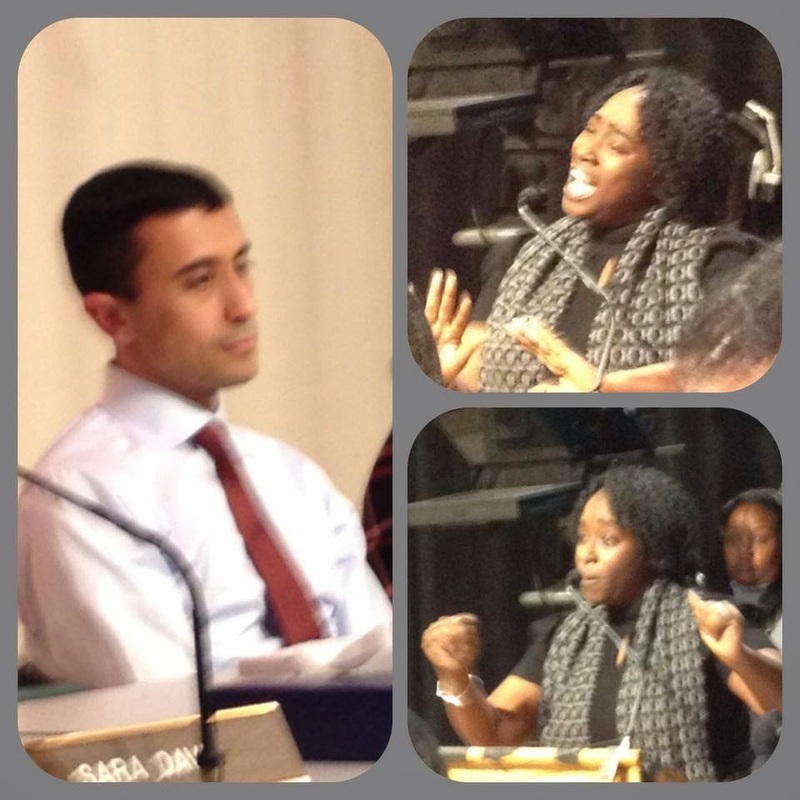 When I saw a picture of Camden activist Mo'Neke Ragsdale passionately commenting at the last Camden Board of Education meeting, juxtaposed with the cold indifference on the face of Christie appointed Superintendent Paymon Rouhanifard, I shuddered. This is what happens when education tourists like Rouhanifard are endowed with boundless authority by an out-of-control Governor and his recklessly destructive Department of Education. These images sent a clear message to me. Rouhanifard, with his six whole years in education, feels free to summarily dismiss Mo'Neke and her life's worth of experience in Camden. They are of no consequence to him, as he answers only to Christie and Cerf, not the parents or students. We must all, each and every one of us, STAND WITH NEWARK AND CAMDEN! Please, take the time to read Mo'Neke's words, and then imagine how Rouhanifard could possibly sit so dispassionately while listening to her plea to save Camden's public schools. As a parent, I’m frustrated with the recent push of privatizing public education in Camden, New Jersey. As recent news reveals the plans of takeover of another one of my son's schools, I can’t explain the outrage. My child’s first school was closed and hostilely taken by the Urban Hope Act (UHA bill 3172). Let’s talk about bullying…. I’m fed up with our politicians, political hacks, and the rich dictating the choice I have for my child. Nepotism at its best is being ignored in Camden. Ironically, our Senator, Donald Norcross, sponsored the Urban Hope Act, and his brother, George Norcross III, acquired the former community based school, Lanning Square. I am a parent of four children; three of them are graduates from Camden’s public education, and they all attended the former Lanning Square school. I am proud of their accomplishments of continuing their education and their careers. As I listened to our student representatives on the Board of Education, I felt their pain. Our students felt the need to defend their schools, and their education and brag about the acceptance to colleges, because our Superintendent and Governor were ignorant to the test scores in 2012 (publishing that only 3 students in Camden are college ready). These are the same people who have the power to make decisions for schools. Now, I witness appointees, politicians, and people (who don’t have children in our school system) call our children & teachers failures, dictate and create plans and proposals of deform and deregulation. This is what I call a new world order of discrimination, inequality, apartheid, and gentrification in the urban areas. I have to ask myself, what’s the true meaning of Racing To The Top? Is it a competition to see which billionaire can make the most profit off of our children? Which politicians have the most political power to suppress their people? Or which appointee gets paid the most to carry out the master’s agenda? Sadly, education reform is not in these plans. We hear longer school days, midday dinner programs, Common Core initiatives, and principal turnaround. Where is the plan to rehab and create efficient and safe buildings, implementing career driven/college courses, creating an interest in subjects and projects for our students? What about interventions to prevent students from dropping out? We must stop this plutocracy of creating neoliberalism in our city. Our state took over the district supposedly because we failed our QSAC (Quality Single Accountability Continuum). But wait... the state failed us first! Yes in 2002 the state took over our board of education for 10 years. In 2010, we get an appointed board, by our current mayor Dana Redd, with a state monitor. Do the math. Three years later and we're under state control again in 2013. This equals... we have been under state control since 2002. Wake up people, the state is still failing us! Where are our evaluations for QSAC? Our buildings are dilapidated, wires too old to accommodate new technology, vocational programs have not been renovated, extracurricular programs cut, stability of teachers have been outsourced, parental involvement has be suppressed, pleasure of learning became a test, and now they are leasing our children's future away. I’m sick and tired of the Ed’s and Med’s plutocracy! It’s time for Res and Feds democracy! This apartheid of inequality, discrimination and harassment is taking us back to 1955. So, Governor... you appointed an inexperienced superintendent, paid him $210,000 to give away our schools, and sell our children's education because YOU fail us.